Gumdrops have been around since before the Civil War. I had no idea. Of course, since pectin or gelatin as we know it wasn’t invented until almost the mid-1900s, the earliest versions of gumdrops were different than what we know and love today. Oh, my, they are among my favorite candies. Those colors are so vibrant and pretty. They’re just the right size to pop one (or two!) into my mouth. The fruity flavors are varied and sweetly satisfying. And the sugar that coats each and every one melts deliciously on my tongue. Gumdrop was once used as an endearment meaning ‘sweetheart’ or ‘sweetness’. Anyone remember the saying “Goody, goody, gumdrops!” ? And we all know about the hugely-popular Candy Land game that features mountains of gumdrops on their boards even today. What little kid didn’t drool over the pictures and wish the entire thing was real? I sure did! As a variation, gumdrops are made as spice drops with flavors like mint, cinnamon, close, licorice (my fave!) and allspice. Here’s a salad recipe that should really be a dessert. (But it has fruit in it, so that makes it healthy, right?) I found the recipe in a vintage magazine, and the ingredients can easily be substituted for modern-day convenience sake. I recently made it for Thanksgiving, and it was a beautiful side dish. I discovered the juice from the 20 oz can of pineapple came out to EXACTLY 1 cup of pineapple juice. Yay! 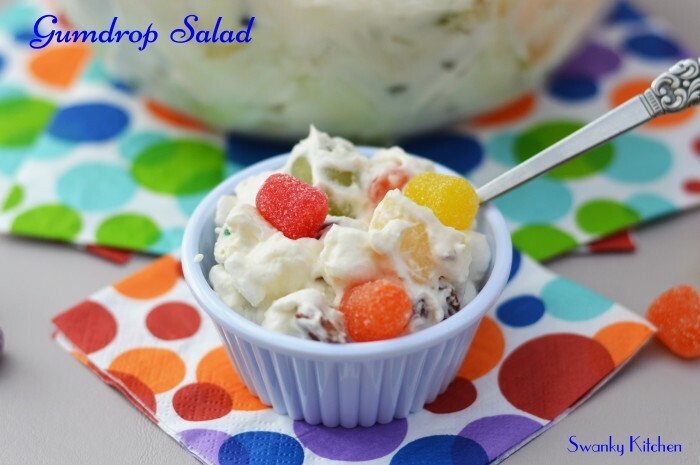 Lite whipped topping could easily be substituted for the dressing. But this version had great texture and folded beautifully around around the fruit. Except for the pineapple, I used fresh grapes (does anyone even make canned grapes anymore??) and two fresh clementines for the canned mandarins. I would’ve used fresh pineapple, too, but I needed that full cup of juice. I served the salad in a crystal bowl and garnished it with gumdrops on top. The colors just popped! But save the garnish until just before serving. I discovered the sugar melted on the gumdrops. Oh, well. I just added more! Dressing: Combine sugar, flour, salt, lemon juice and pineapple juice in saucepan. Cook over low heat, stirring constantly until mixture thickens. After cooling, fold in whipped cream. In large bowl, mix pineapple, grapes, mandarin oranges, gumpdrops, marshmallows and pecans. Pour dressing over fruit and stir gently to coat. Chill salad in covered bowl for at least 8 hours. Makes 12 servings.